I just love a good, solid farm table. I hunted high and low for months for the perfect, huge (and affordable) farm table for my dining room in my new house last fall and didn't find it... I ended up with a large trestle table that I really love, but I finally found that elusive farm table a few weeks ago! he reached bare wood! 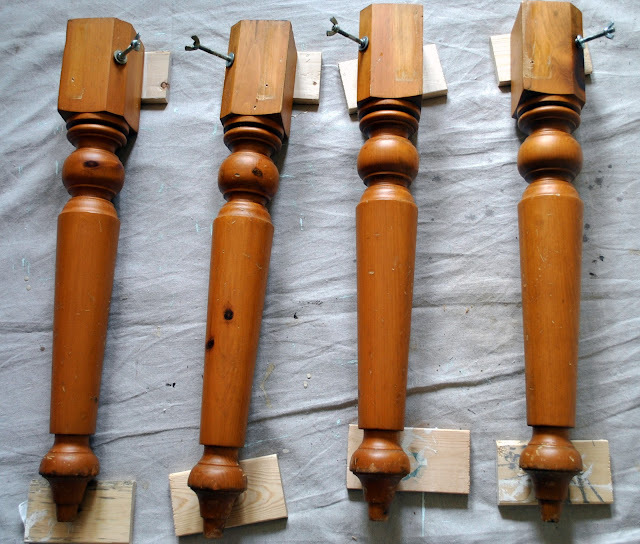 I followed up with medium-grit sandpaper to get everything all smoothed out for the stain. I applied two coats of a dark walnut stain and gave the top a little more sanding to give the finish a more distressed look of an old farm table that's been used for many years. I finished the top with wax and a good buffing...that was quite an workout for the arms! I also added both dark and clear waxes to give it a further distressed look. I just love how the chalk paint lets me layer the finishes...it gives it much more depth! This is the perfect table to fit a whole family around now! I love your table! Great job on the finish, I would love to find a table like that! I'm visiting from 1929 Charmer's party, and I'm now a follower! It looks amazing! I need to redo my big farm style table. And that runner? I am definitely making one of my own, thanks for the inspiration! Such a beautiful table, me like *smile*. Have a nice day. That table is stunning, Kristen! I love your ruffled runner, too! Can't wait to see it in your room! This turned out wonderfully! I like the layered texture you added to the legs. I've pinned this for my summer re-make of our kitchen table. Thanks for sharing! This is so pretty! I love how it turned out! Worth the work out! Oh my gosh, this is fabulous!! Your hard work really paid off, it really IS perfect!! Wow! What a really great makeover! I love the finish. Stopping by from Tuesday's Treasures. Oh my goodness, this is gorgeous. Love the colors. This looks so rich and I bet looks beautiful in your room. you did an amazing job on this! the layered colors are gorgeous! Its always a wonderful feeling when you finally find that elusive piece and this one was well worth the wait. Gorgeous. Thanks for sharing. That turned out just gorgeous! Thanks for the idea about sanding the top after staining, I wouldn't have thought of that, but it looks GREAT! That is an awesome table and the finish is fabulous. Love it! This was a table worth waiting for... especially since you gave it a makeover! What a beauty! I would love to see what chairs you pick to go with it! An exceptional piece! Gosh your table looks amazing, love the dark maple stain on top, it's my favorite. Never used the duck blue color paint but it really looks good on the legs with the white on top. Very incredible transformation. Look fab!!! Thanks for sharing your creative inspiration at Sunday's Best! Beautiful table! I have an old thrift store dining table that I would love to redo like this! Thanks for the tutorial. Found you through Tuesday's Treasures. Well done! It's a grand table. I love it. Your table turned out beautifully!! gorgeous! you did a fab job!! Oh my gosh - that is one beautiful table, Kristen! GREAT job on it! Wow! 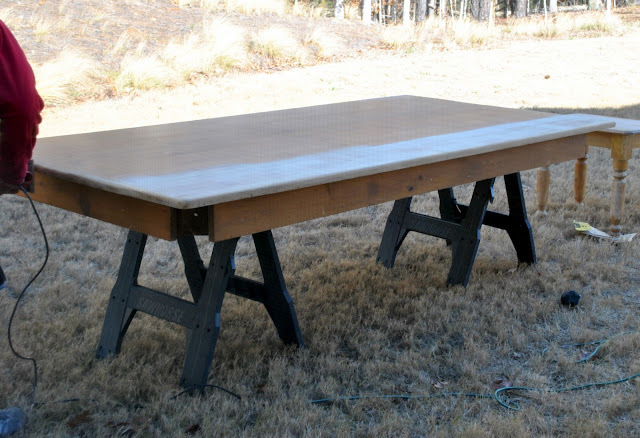 I would love to have a farmhouse table this is beautiful, you did a wonderful job! Hope you stop by my place! I just saw your feature over at My 1929 Charmer. I Love what you did to your New Farm Table... Now all I need is a Farm and a Farm Table and I can call it good.. :) Just became your newest follower.. :) Have a great weekend!! complete gorgeousness! i love me a farm table & this totally fits the bill. i want one too! Bad! Just found your blog & i'm off to explore more of it - would love to have ya pop over for a visit sometime! Absolutely stunning! I love how redid it and made it look so authentically aged! The table runner is beautiful too, excellent work! Saw that you were featured on My Uncommon Slice and I wanted to come say congrats!!! Love it! Amazing job girlfriend! Beautiful table! Thank you for joining me at Home Sweet Home!